Are you ready to start exploring the world of virtual reality (VR) but feeling intimidated by having to learn complicated software and the upfront equipment cost? Consider starting with 360-degree video — and jump right in! 360-degree videos are recorded using omnidirectional camera or a series of cameras. During playback, you can view the recording in all directions (hence the name 360-degree video). This type of video can be played back using a VR headset, a mobile device, or a desktop computer. Whether you want to use a 360-degree video for a virtual walkthrough of a workplace, an immersive compliance training that shows compliance protocols in action, or a clickable branching scenario, in which the viewer chooses one of several paths at the end of each segment, there are a number of good guides to getting started. Once you have the camera and the software, the question becomes, “Now what?” Here are five tips for getting started. Unless you’re intending to reproduce the movie “The Hobbit,” don’t shoot your video too low to the ground. Placing the camera at the same height as the average viewer’s head allows him or her to get immersed in the video. Use a tripod or a monopod to avoid awkward, shaky videos. These devices will help to keep your shot steady and avoid giving your viewers motion sickness. Be sure to choose a stand that has shorter legs and nothing sticking out at the top. Remember that when viewers look down in a 360-degree video, they’ll see what’s below and to either side of the camera. You don’t want them to see the extended tripod feet or long tilt arms. Tip 3: Lights! Camera! Action! 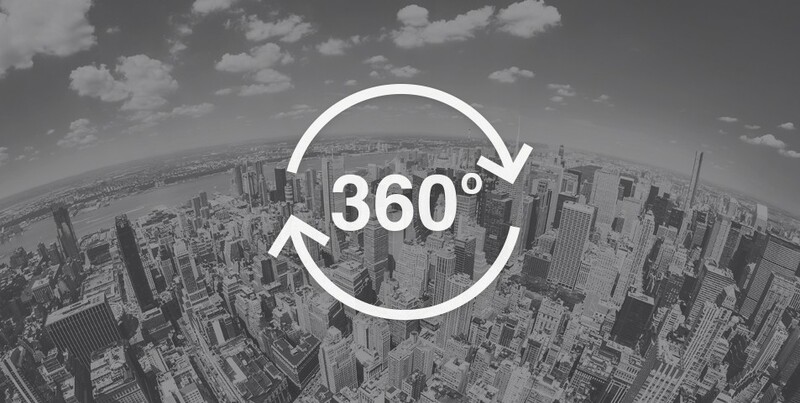 360-degree video means that the viewers will expect to look around and see something happening. Be sure to include some activity or points of interest in various places to make the 360-degree experience compelling. When recording a building walkthrough, for example, spend time in rooms that have interesting content from all angles. Don’t linger on long, bare hallways or boring stairwells. Allow your viewers time to orient to the 360-degree experience. Give them plenty of time to look around, and then focus their attention by providing talking characters, virtual signs, and links. Most 360-degree software editing programs allow you to overlay information onto your video in post-production. Use these overlays to point out important information or call attention to significant events. For example, you could add arrows to point to items of interest, provide text boxes with extra information, or include links to related videos. Walter, how difficult is the post-production process? Is the editing software fairly easy to use? 360 Cameras often come with software that is fairly intuitive and easy to use. The Samsung Gear 360 comes with ActionDirector, for example, and it is a fairly intuitive program. Programs like this often will automate the stitching process (where you take two 180 degree videos and put them (“stitch” them) together). This type of program is great to start with. More powerful options such as Adobe Premiere are exceptional, but have a steeper learning curve.